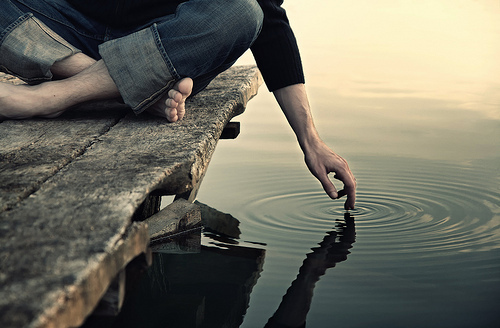 Have you ever thought about how touching water makes a ripple? Think about when you throw a stone into the water how it affects all the area around the point of contact. From the start of the first small ripple it grows into a large ripple. You can throw a small stone and make a huge impact with the ripple, I call this the ripple effect. The ripple effect applies to how we respond and interact with one another. Take the cashier at Wal-Mart for instance. She can be having a horrible day, not friendly to you because of what she is dealing with, and it will effect your day. The ripple effect will be, you jumping in your car, driving aggressively and get a phone call and respond with an attitude to the caller. We will think how someone could have been so rude, and get offended over something that actually had nothing to do with us. The same is true if you get a phone call that someone wants to bless you with a gift, this will effect your entire day in a positive way. The ripple effect will be, because of someone’s action it created in you a positive response, which will in turn causes you to be kind to someone else. This brings me to a story that happened while living in Chicago. Wow, that was a culture shock living in such a large city. Imagine everything you need within walking distance. People packing the streets busy about their day. Cars and their horns blazing. Sirens blaring and the yellow of cabs flashing by as you walk to your destination. Many people make these very streets their home. A place to lay their head and a place where they may find food to eat. I will never forget the lives I passed daily who lived on the very street I walked to school every day. Do you think the passersby thought about the ripple effect? What about those who pass by and give no thought to the fact that these are lives, not just something to walk by as quick as possible. Ignoring these lives has a ripple effect, it says you are not important enough for me to stop by and say hi. Muchless ask if they have a need that could be met. I daily passed by such a person when I would walk off of the “L” train. She would stand in the same place everyday not bothering anyone. She had a shopping cart with her full of things that we would throw away. On the cart were plastic bags tied to the side, of what I would assume were items she didn’t want to get wet. She has such a sweet presence about her. Everyday she would be singing and humming with such a joyful heart. She didn’t know that she was having a ripple effect on me. As I made it home each day I would have her on my heart. God began to really speak to me about her . I felt in my heart I needed to reach out to her and bring her a hot meal. I really wanted to do something that would really make her happy. As I stepped off of the “L” train I approached her, this was the day to reach out. I said to her I had some chili on the stove and if she would give me 30 minutes I would make cornbread and bring her dinner. She said to me, “oh sweetie thank you so much but if I want to get a bed I have to be on time, thank you.” Oh gosh I felt like I had been gut punched. I knew the Lord had told me to feed her and to reach out. The following day I didn’t even say a word, I ran straight up ( took the elevator) I lived 15 stories up, put some chili in a bowl and ran right back down. She was gone. Oh how my heart hurt, I felt I was missing the Lord on this one. The weekend rolls around, I look out my window and I see her in her usual spot. This morning I made bacon, eggs and biscuits. I pack her a nice meal up and take off down the stairs, as you can guess she was gone. At this point I gave up, I thought forget it, I tried. Isn’t it funny how we want to make sure things are “perfect” and “just right”? Often times God just wants us to make the step and let Him do the rest.One evening I make my way home, I see this joyful spirited women and I say to her,” stay right here, don’t go anywhere I will be right back.” I booked it up to my home, I had zero groceries at the time because I hadn’t had time to shop. I ran to my closet and found a pair of wool socks and new tennis shoes. I had noticed she had holes in hers. I grabbed saltine crackers and some more “whatever is in the pantry” and I grabbed my Bible, packed it all up in a box and ran down the stairs.She was still there, I was so excited to see her. I said to her, Jesus told me to bring you these and I want to give them to you. She looked at each thing, but much to my amazement was her response to the Bible. She grabbed me, hugged me better than I have ever been hugged before and started singing a worship song. She loved the Lord and could not believe she now had a Bible. She kissed me on the cheek and thanked me over and over. I told her, this was from the Lord. This still brings tears to my eyes today. I left her and never saw her again. She was never there to greet me with her singing as I got off the train. I never saw her pushing her cart around making her way to where she slept in the evenings. To this day I believe she was an angel of the Lord. The Bible says we will entertain angels and not even know. What I thought was me doing a good deed and doing my best to listen to the Lord, turned into impacting me in a life changing way. She had a ripple effect on my life and I am sure on so many others. Today, this has set me on a course for helping those in need. To see the value in everyone. To take the time to talk with someone and make sure they know they matter. The one pebble of encountering one of the most beautiful people I have had the pleasure of meeting, created a ripple so large that it still reaches others. As you go about your day, think about the impact you have on someone else. Something as simple as a kind voice tone and attitude can have a ripple effect to help change someone’s day. Next time you are at the check out counter, think about how many people the cashier sees a day and does anyone take the time to just talk and see how they are doing. When you go home to your spouse, take the time to notice one another. This list can go on and on. Jesus made a HUGE ripple when he went to the cross for us that is still making contact with lives every day. Jesus will lead you to someone if we will be open to listen and obey. Make a ripple today.